Tis the season of candy canes so why not bring some of the cool festive sweetness to your wardrobe. 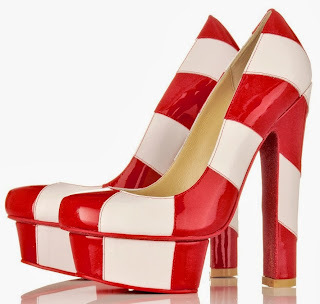 Featuring a patent/calf leather upper in wide cherry red and crisp white candy cane stripes, a fun red glitter sole, and a covered, thick 6.1" with 2" island platform, these handmade Kandees Shoes Cherry Twist Pumps are perfect for the holiday season. The best part, these are currently on sale for only $50.34, get them HERE while they last.